I guess I need to clarify what type of bbq I am looking for, Burnt ends of course wqill be eaten, but I am looking mainly for ribs, as most folks know I am a rib eating freak, I have smoked either spares, bb, or beef ribs pretty much every weekend since March of this past year. Other items will be sampled(brisket, etc), and sides arnt really important in my search, my focus is ribs. Last edited by jimswside on January 6th, 2010, 3:42 pm, edited 2 times in total. 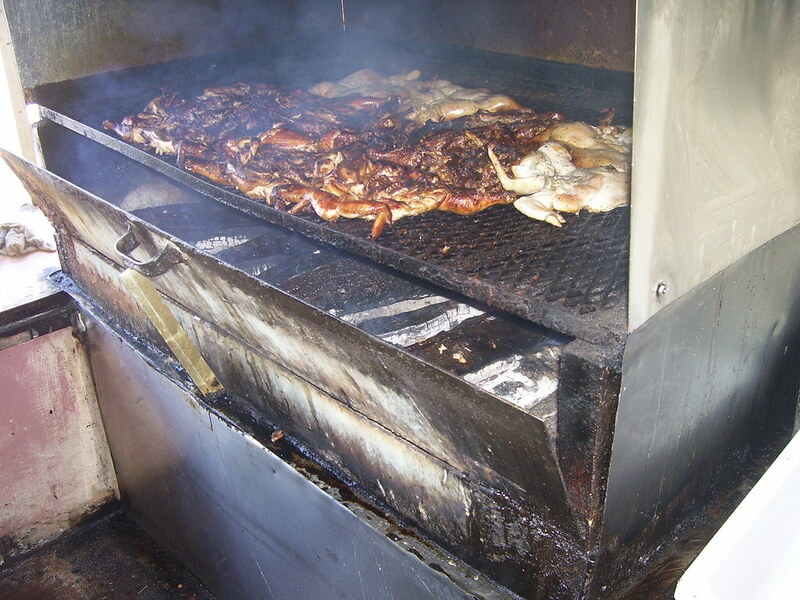 BuddyRoadhouse wrote: Johnny's isn't a high profile place, but it serves solid 'Que every time we visit. Ardie brought us here calling Johnny's his "neighborhood 'go to' greasehouse". If you're looking for the Texas roadhouse charm of BB's or the urban edge of Bryant's this is not the place for you. Johnny's is in quiet Roeland Park, Kansas, and has an appropriately suburban feel. Good all around Barbecue with no particular stand outs, solid sides and good service make Johnny's worth a stop. I can easily walk to Johnny's from my house, and that means something quite different here in KC than in Chicago. We never go. Prefer RJ's Bob-be-que, equally close, better 'que in my opinion, but still no place that I would recommend to an out-of-towner as a special stop. 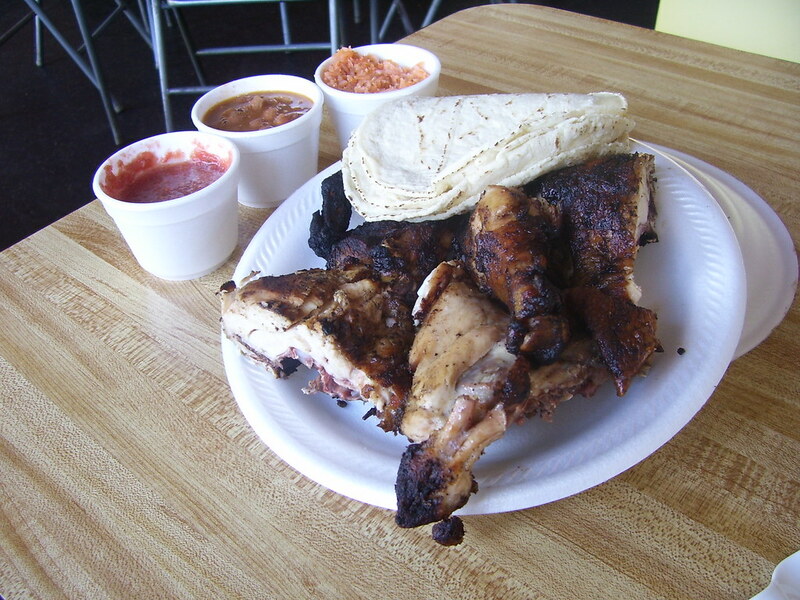 El Pollo Rey--yes!! I know I've mentioned this place in passing on the KC board, though had a comparative pollo asado post I was so long in compiling that it got left by the wayside. Thanks for the reminder. I've also thought about putting together a good list of special, non-BBQ spots here for visitors. El Pollo Rey is definitely on it. Look at those birds! Look at those logs! You've been talking up BB's for a long time, Buddy, another place I really need to make it to. smokin' guns is on the short list, and I think we are staying in North KC. Well, I've held my peace long enough. I know that Aaron and some (to remain unnamed) others don't think Okie Joe's is worth its reputation. Huh. I'm here to claim that it is, and that you should visit the place to try their ribs, fries, and red beans + rice. Each of these three is top-'o-the-line. Plus, when was the last time you ate ribs in a gas station?? LC's is undeniably a required visit. I don't know the other places except by reputation, altho' I visited BB's a couple of times and wasn't much impressed. Stroud's...what can I say? I live about 3 mins from the Fairway location. I've only gone once, which should tell you something. I used to go frequently. The shop up north is better, I think; certainly it's more fun. Golden Ox. No question: it's *real* Kansas City. Have a great time, a happy birthday, and report back! YourPalWill wrote: Great god, Buddy. Just when i thought I knew all there was to know about Kansas City Q, you expand my universe. Thanks for those additions to my list. Will, if you really want to expand your scope in the KC 'Que-niverse, you should look for a used copy of Ardie Davis' book, "The Kansas City Barbecue Pocket Guide". Granted it was published more than 10 years ago and is, as far as I know, out of print. But if you can lay your hands on a copy you will be clued into more than 50 of KC's best greasehouses. Aaron Deacon wrote: I can easily walk to Johnny's from my house, and that means something quite different here in KC than in Chicago. We never go. Prefer RJ's Bob-be-que, equally close, better 'que in my opinion, but still no place that I would recommend to an out-of-towner as a special stop. Yeah, I forgot about RJ's. If backed into a corner I too would recommend RJ's over Johnny's. Along those same lines, I would recommend not going to Gates if your passion is ribs. A more anemic rack of bones I have never seen. Like I said, gimme Gates' brisket, maybe their mutton, for sure their fries and beans. But you won't catch me throwing my money away on their ribs. Also, I've been reading good things about Smokin' Guns but have never been myself so cannot comment. I am in Geo's camp on Oklahoma Joe's it is some of the best rib's I have ever eaten ( in a restaurant!). That is a MUST! It is right up to Mike Mills joint as my favorite ribs anywhere! I also think any true bbq guy like yourself owes it to himself to check Arthur Bryant's! The book Buddy was refering to written by Ardie Davis and Paul Kirk each picks Oklahoma Joes in their top 10 and Ardie still includes Bryant's. I agree about Gate's not being a great rib joint. LC's is dynamite! Also in their places they like to check out are: Smokin Guns, this seems to be a couple who won a ton on the competition circuit and then opened a joint! Just like ok joes, pretty new. They also picked Quick's and Rosedale. A buddy of mine's uncle owns Woodyard, it is damn cool but not sure it is worth the drive with the family on what you are looking for. I wish the original Stroud's was only 2 blocks away from BB's! Loved stuffing myself with all that chicken and sides and walking over to Lawnside for some Blue's! Heck sometimes I would barely be able to get that first beer down! A few beers later and some good blues at BB's I was ready for a BBQ sandwich! That old pit outside has some serious history! Jackstack has not been mentioned at all but if I am on the plaza and in a pinch it can do the job, the other location at the old Union Station is a beautiful restaurant and the cheesy corn bake is one of my favorite sides anywhere. If you want to do it up on your birthday dinner I say head over to the plaza to Plaza 3. It is a top notch steak house and kid friendly, white cheddar au gratins amazing as well as the steaks! For a KC institution you can check out the original Hereford House, I remember my dad taking me there over 30 years ago when we went to the Big 8 basketball tournament! Yes the Big 8! Last edited by Cbot on January 7th, 2010, 3:36 pm, edited 1 time in total. That picture should be illegal!!! Awesome! Hey! That's my picture . . . so, thanks! I thought that pic looked familiar from upthread. the pics you took at LC's, plus all the positive feedback I have received here, and from other sources has them at the top of my list. And check out the fries at LC's: they're hand cut, greasy, big, and TASTY! I have to say that after a spending a 4-day weekend in KC this past July, essentially doing nothing but eating, those burnt ends from LC's are one of the 2 or 3 dishes I think about most often. Seeing that picture again is making me very hungry! During my pigrimage to KC a couple of years ago, I stopped at 4 BBQ joints, and here is how I would rank them. 1. Smoking Guns. N. Kansas City, MO. Opened by a competitive team, this smallish place churned out the best ribs I tasted on my trip. They were out of burnt ends when I showed up (they go fast), and the beans were very good. 2. Jack Stack's. I am probably going to catch some grief for this one because it is not a joint as much as a suburban looking restaurant. However, the beans were the best I have tasted in my life. The burnt ends were the best on the trip, and I even tried both pork and lamb ribs which were pretty good. I didn't get a chance to try their prime beef ribs, though that will be ordered if I get there again. 3. Arthur Bryants. They say the place is a shell of what it used to be. It was still very good. Best fries on the trip. The ribs were pretty good too. Worth going to for the history too. 4. Oklahoma Joe's. Now, I went to the location in Olathe, which may make a difference, I don't know. I ordered as in the other places on the trip, the ribs, beans, and burnt ends. The burnt ends were weak, few if any of the pieces had bark on them. It was more like cubed interior pieces of brisket with sauce smothering them. The beans were very interesting as they used several different types of beans and even had a slightly fruity flavor to them, not in the class of Stacks or Smoking guns though. The ribs, which they are known for just did not stand out. I suspect because of the difference between my experience and the other reviews that the suburban Olathe branch is just not as good as the original. glennpan wrote: Oklahoma Joe's. Now, I went to the location in Olathe, which may make a difference, I don't know. I ordered as in the other places on the trip, the ribs, beans, and burnt ends. The burnt ends were weak, few if any of the pieces had bark on them. It was more like cubed interior pieces of brisket with sauce smothering them. The beans were very interesting as they used several different types of beans and even had a slightly fruity flavor to them, not in the class of Stacks or Smoking guns though. The ribs, which they are known for just did not stand out. I suspect because of the difference between my experience and the other reviews that the suburban Olathe branch is just not as good as the original. I'm something of a minority opinion around here, but that sounds like my experience at the original location. Often met with, "Yeah, but did you try the Z-Man?" Which is their sliced brisket sandwich topped with melted provolone and an onion ring. Very popular. leaning towards taking amtrak down, almost cheaper than driving my truck and no wear and tear. staying in N. Kansas city about a mile from Smokin Guns & 4 miles from A Bryants. Looks like we may just cab it around for the couple days we are there. How are the cabs and public transportation in KC.? jimswide wrote: How are the cabs and public transportation in KC.? In a word: really really really lousy. The busses are few, far between, and don't go where you want them to. Cabs are few, far between, pricey, and unreliable (= you call them and they either don't come, or they come late). One plan would be to take the bus to a major hotel, where it's always possible to get a cab. That's how you get to, e.g., L.C.'s. But I don't know how you're going to get back. Might be cheaper to rent a car. If you don't go to the airport, you might find a deal at one of the secondary offices. thanks for the tips on the cabs. When I went to KC, I started off the trip without a car and was frustrated at getting around to the different areas. Once I rented a car, though places were spread out, it seemed to take about 20-25 minutes to get virtually anywhere in the KC area, pretty quick. No doubt the train is fun, but the Enterprise half price weekend deals are hard to beat. $50-60 for a midsize with unlimited miles for 3 days is something we use occasionally. if we drive we are going Sunday - Wednesday, and if we take the train we are going Sat - Weds. Alamo is offering a $10/day weekend special in most markets (Thursday - Monday). LC's beans ain't so bad neither. I assume you were with a crowd of people for all that grub. One burnt end sandwich, an order of fresh cut fries, and a pint of beans will feed me and my wife plus leftovers. LC's belies the old joke--the food is good and the portions are huge! LC's fries have just *got* to be the best in the city. Yeah, that was three sandwiches and sides for a family of four, and we still threw food away, sadly. BTW, I was so focused on LC's, I forgot to comment on your experience at Jack's Stack. First off, let me just say it is a tough thing to find really bad Barbecue in Kansas City. Some places are better than others, some are just plain pedestrian. But to actually find 'Que in KC that is so abhorrent that you would not under any circumstances make a second trip there, that is a rarity. I would put Jack's Stack in the pedestrian category. Admittedly, I have not been to any of their newer locations (Overland Park, Country Club Plaza, or Union Station), but I have been to their Martin City outpost on numerous occasions. The food was good, not great. Their signature side dish items, the cheesy corn bake and the stack of giant onion rings left me thinking, "Meh." The meat itself was okay, but far overshadowed by the trappings of the restaurant itself. The whole experience put me in mind of the Montgomery Inn in Cincinnati; overpriced, overdecorated, appealing to a crowd that values appearance over (or at least equates it with) food quality. The only difference being that Jack's Stack actually does real Barbecue, ordinary as it might be. To my confusion and consternation, Jack's Stack is lauded at numerous other food oriented sites. Give me the run down, un-pretty places like LC's, the late, lamented Jones BBQ, or The Wood Yard any day before I'll spend the time or money at Jack's Stack. BuddyRoadhouse wrote: BTW, I was so focused on LC's, I forgot to comment on your experience at Jack's Stack. First off, let me just say it is a tough thing to find really bad Barbecue in Kansas City. Some places are better than others, some are just plain pedestrian. But to actually find 'Que in KC that is so abhorrent that you would not under any circumstances make a second trip there, that is a rarity. I have to agree. My one visit to the Jack Stack at Union Station for the lamb ribs was quite disappointing. No smoky flavor. A rather heavy sauce. And the fancy restaurant vibe is kind of off putting. I've grudgingly come to appreciate that Jack Stack. The Freighthouse restaurants are a really nice trio (Jack Stack + Lidia's + a new very good Austrian place called Grünauer), all within walking distance of my office, and all business lunch friendly. Sure, I have to grimace through proclamations of the best BBQ in the city, but I think the point about, if this 'que was plopped down in River North, Chicago would be ga-ga, is pretty accurate. It's a nice place for sure. It's no Bryant's or LC's, but I can't say a Jack Stack visit has ever replaced one of those. It has it's place, and the food is pretty good. That said, for readers of this board and others like it, don't set your expectations too high. Jack Stack is the place to take your elderly relatives. Also you can make reservations. They have high chairs, and they have a full bar. Plus they have beef ribs. It's for those who are not in the mood for an adventure.